Just test Dannes latest build. 1080p 24 and 48 fps are corruption free, and with nice preview , i think it's the best build i've tested. Only issue is that when fps override is on there is some vertical lines in video. But i don't think it's a big problem fore more users. Thank you Danne for your work. Again. fps override will interfere with static set fps. What fps are you aiming for? I could set a preset for another fps, let´s say 25fps in the sub menu. Or you can also use reg_6014(decrease it) to achieve higher frame rates. Of course, the higher frame rate, higher risk for corruption. I try to set it to 23.976 like an experiment , and saw that lines , but it's only visible in 2.35:1 aspect ratio , in particular use i think nobody will use that value on practice. So I think the last build is incredible. Eos m is now more usefull than first BMPCC . Nice. Yeah, it´s very versatile. Be sure to check out the x3zoom which gives a really nice tele resolution at 1x1 pixel ratio. Nice to use even for 48fps. +1! I am looking mostly for 23.976 and 25.000 fps. If this would be possible via submenu, this would be cool for quick setup. I really like this for focusing! Unfortunately this can't work for 1x3 mode. Yeah, 24 or 30 is what I shoot most. But in this situation, tre most stable is all that matters. 30 fps is probably not gonna work too good. 25fps more so. For focusing masc? But x3zoom will also record in this mode. Are you after a tempory zoom function? @masc 1x3 real time view is preeeetty anamorphic. Better than nothing. Fixing it is beyond my horizon atm. Oh thanks so much Danne! I'll try out this evening! na, think your sync is ok.
Is there some benefit to 25FPS vs 24FPS? Let me just say, WOW. This camera has come a long way! Danne, I can't thank you enough for your contribution. I almost gave up on it, because of the frustrations I had with image quality and all the hassle of settings, but with this newest version (crop_rec_4k_mlv_snd_isogain_1x3_presets_2019Feb11.EOSM202) I literally just installed, enabled the modules, and set the 2 presets to autorun. I am VERY new to this (hence the struggling with focusing in the videos), but these developments have given me the push that I needed. Below is a sample of what I was able to get out of this rainy, foggy day. First two are handheld, second two are tripod. This was taken with a Canon EF 1.8f STM and the Commlite adapter. I just ran the MLV files through the MLVApp to get H.265 format MP4s. Be sure to check out the x3zoom which gives a really nice tele resolution at 1x1 pixel ratio. Does this x3 zoom turn mv1080p into moviecrop mode? Tested against highlight recovery sliders in Mlv App. Could probably need some more testing. It´s also arguable if analog gain regs should be pushed a little to get closer to 3000 but seems it works good as is right now. spent some time with today's build. mv1080 with x3zoom gives me vertical jagged lines like 3x1 modes. so i tried manually activating x5 zoom and jagged lines are gone but also it says mv1080 works only x1 zoom mode. i never needed to change resolution and aspect ratio in the raw video menu but when i want to get continuous 2.5k 16:9 setting. 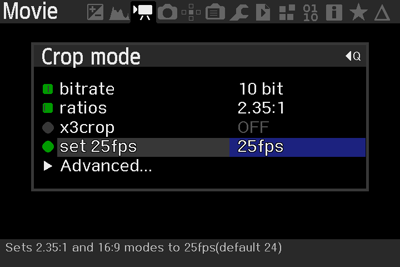 if 16:9 preset in crop mode menu could be a continuous setting like 1920x1080 it would be usefull. 4.5k anamorphic title at the bottom line of the global draw is a little bit long and it causes focus distance value disappear. it appears when focus ring is turned but that's laggy and usually no use. so the title might be shorter. and i only have corruption with mv1080 48 fps x3zoom. reuploaded a new build. Missed a line. Whitelevel seems to be correct now! Cool! there is also another issue with dual iso. i couldn't end up with a video that doesn't flicker when dual iso is on. i tried various iso combinations with still shots and moving camera and it always flickers without any color adjustments. tested 1x3 mode and mv1080 (in which i'm well aware of having smooth videos before). i'll try again tomorrow though. i couldn't end up with a video that doesn't flicker when dual iso is on. X3zoom for infinity focus. Are you using it as a dedicated focusing tool switching back to non crop when recording or is the x3crop used when recording? Regarding dual iso an example file would be needed for checking what's going on.